Every Jack comes complete with an adjustable top clamp/clevis for use in clamping and winching. Safety bolt is designed to shear at 7,000 lbs. (3175 kg). For speedy disengaging, lifting unit automatically drops away when load is removed. 4-1/2" (11cm) long lifting nose for positive contact with load.. The Hi-Lift X-Treme is for the serious Hi-Lift user, offering the Top of the Line all cast version with special features that include, Charcoal metallic powder coat finish, provides a truly unique look that separates it from the standard Hi-lift. 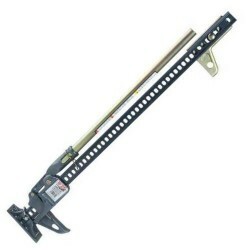 Gold Zinc-coat hardware-and handle, the unique winch ..
A must-have item for Hi-Lift Jack owners! The rugged polyurethane Hi-Lift Handle Keeper firmly holds the Hi-Lift Jack handle to the upright steel I-beam of the jack, keeping the handle in place when not in use and eliminating rattling during transportation and storage. Hi-Lift’s unique design allows..
Increase your support surface area and make the original power tool even more versatile. Use the Hi-Lift Off-Road Base to alleviate jack sinkage on soft ground. Use the Hi-Lift off-road base to alleviate jack sinkage on soft ground Convenient to use Easy to store..
Protects your Hi-Lift Jack from weather, mud, dirt and sand. 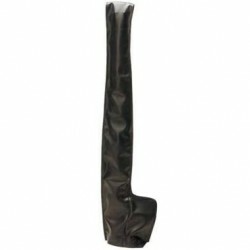 Made of durable vinyl-coated nylon, the Jack Protector is waterproof, as well as mildew and decay resistant. 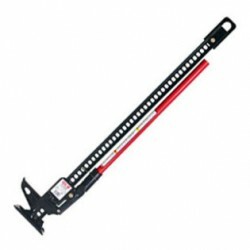 Fits 36", 42", 48" and 60" Hi-Lift Jacks. The Jack Protector WILL work with the 4XRAC and the LOC-RAC (user will have to place hol..